This press release ended up in my inbox this morning. Its great to see the OWS movement not only occupying public space but also those private spaces which have intruded on our shared public environment. If the messages of commercial advertising encroach upon our minds then it only seems fitting to retake them and use them to project our collective visions. The California Department of Corrections (CDC) has unveiled a new campaign of bus shelter ads to confront America’s home foreclosure crisis. During the week of January 16th, the CDC successfully apprehended, rehabilitated and discharged more than one dozen bus shelter advertisements throughout San Francisco, including the intersection of California and Davis Street, one block from the Federal Reserve Bank of San Francisco. 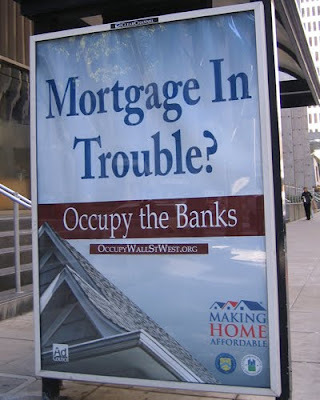 The CDC’s red, white and blue advertisements declare: MORTGAGE IN TROUBLE? OCCUPY THE BANKS along with the website, www.OccupyWallStWest.org. Produced with the assistance of the U.S. Department of the Treasury and the U.S. Department of Housing and Urban Development, the corrected advertisements feature the rooftop of an American home set against clear blue skies with the phrase: Making Home Affordable. The corrected ads were released shortly prior to January 20th in anticipation of a day-long, nonviolent shut down of San Francisco’s Financial District by Occupy SF. January 20th also marks the one year anniversary of the controversial Citizens United decision by the U.S. Supreme Court, which granted First Amendment protection to corporate political expenditures. Occupy protestors are demanding a halt to predatory foreclosures and evictions by banks and the end of corporate personhood. They will be taking their demands directly to the offices of banks and corporations in San Francisco to stop business as usual on January 20th. Founded in 1994, the CDC is a private correctional facility that protects the public through the secure management, discipline, and rehabilitation of California's advertising. The department was initiated by individuals who felt that public correctional facilities were insufficiently managing the state's most criminal elements and that effective care and treatment would improve under the supervision of a private institution.